New found habit. Let’s again start with a question. What would you expect a country to be after 66 years of independence, knowing very well how a huge spending middle class is a blessing to its economy and national task force? It may not be an astoundingly developed nation but not at least a good 72% of its population are not equipped enough to even fend their own food. That is how we as a nation placed so precariously with our basics gone absolutely haywire. I am sure you must be aware from where I landed up with this 72% number. Correct; our present day government made it quite official that, there are at least 72% among us, those can’t earn their own food. So much so that our government is required to step in and arrange food for them at a highly subsidized rate. And would you believe; this shameless artifact is part of the so called Bharat-Nirman gimmick which an equally shameless government airs on different television channels in expense of crores of public money. In these 66 years of independence, it is the Congress party which has ruled the nation for good 56 years of it. Among those 56 years, striking out the tenure of Narasimha Rao and half completed part of Lalbahadur Shastri, it was patrons from the Gandhi family that were at the helm. Hang-on, before you try to prove my numbers wrong by popping the close to 10 year rule of Manmohan Singh. I can only pity on you if you still believe this Sardar is the real PM of the nation. Take Manmohan Singh to confidence and ask him to answer this himself. The saga of having a proxy priminister for the first time in Indian history would be clear to you. While there are lot of flaws in our country, which otherwise are not expected of a country of our size and potential, let’s start with the basic flaws which even civil war torn nations would feel ashamed to have. And that basic is people getting to have plateful every day to eat. After 56 years of Gandhi family rule 72% of us struggle to accomplish this basic attribute. And we are told since 1971, the fight to curb this acute poverty was started by Congress under the staunch leadership of Indira Gandhi. So sweet of Indira Gandhi to think for the poor, No? ‘Garibi Hatao’, she said to have announced back then and it is 40 years since the hoodlums in Congress are trying their best to ‘Hataofy’ this Garibi, only to end up adding millions every month under the poverty line. 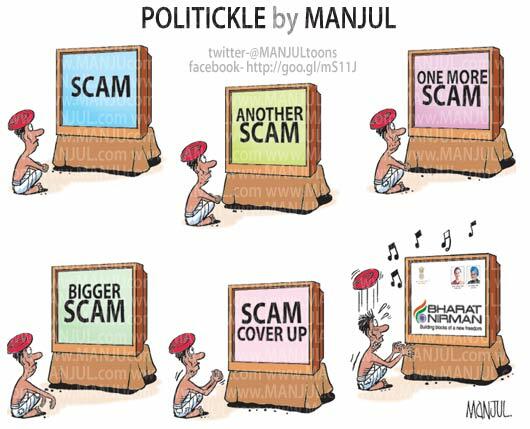 Such is the Bharat Nirman that is going since 1947. There is a good 40% among us who don’t know the existence of something as frivolous as a school on this planet. The number those don’t know how a hospital looks like is even more precarious. Good 35% may not be sure if an electric bulb is round or square in shape. Ditto is the knowledgebase of the existence of currency notes beyond Rs 20/- denominations for 70% of us. But you know what? Such shameless facts don’t deter the morons to air flimsy advertisements to show how they, in the leadership of Gandhi family have Nirmaned Bharat with their sweat and blood and continue to do so. And I only thought, Sambhunath, my Tennis coach is a seasoned liar. Everything this Congress government or to be precise the Gandhi family touched has got ruined in no time. This also includes the nation. Latest testimony of their ruining capabilities is our economy. As a legacy they got a brilliantly placed economy at 8% growth rate from the NDA government. Since the Vajpayee government made the economy so strong that it took this UPA government good 9 years to ruin it to rubbles or else the feat could have been achieved way too earlier. Because of the hard work of NDA, the fruit of success was harvested till 2008 and then the bitter truth of nefarious agenda and massive corruption of this shameless government unearthed itself. And it is nose dive since then. Almost all sectors of our economy are limping and we as a nation are at the doorstep of bankruptcy. But you know what; the charlatans in the Congress camp still believe they have Nirmaned Bharat all through their regrettable tenure. Even the systematic ploy to hide the facts from the nation is another class act that these Congressi stooges are master at. They not only will lie blatantly but also will make you believe, all is hunky-dory. That also includes our priminister whom we believe to be the last honest man still with the Congress party. Time and again, he delivers absolute nonsense for an excuse for the rotten state of affairs. He blames everything, living or otherwise on this planet for the mess that looks so Congress architected but not the real culprits; namely his party and the corrupt those constitutes the party. Worst he blames the BJP for the state of the economy. I am waiting for that day when he starts blaming Indian Cricket team and World War-II for the mess as well. Such is the philosophy of Bharat Nirman. Blame everyone not related to Congress for the self-created mess and bestow the success because of someone else’s hard work, entirely on the Gandhi family, Sonia and Rahul to be specific. Bestowing credit for everything that India can be proud of on various Gandhi scions is another of Congress’s core policies. No wonder why all mega projects, schemes, airports, bridges, dams, stadia, expressways, parks, Sulabh Sauchalayas; you name it and you will find a ‘XYZ Gandhi’ tucked therein. Jokingly I said once – I wonder why Indira Gandhi named all her kids after government schemes. And believe you me, you may struggle to find a temple in a city but you are never far away from a God-damn bridge named after the Bofors tanned Bharat Ratna. Well, Jawaharlal Nehru may give a strong fight to Rajiv Gandhi on who the bigger architect of modern India is but that is fine. All is fine as long as the credit remains within the family. Would you believe, even the scumbag Sanjay Gandhi has few universities, roads and bridges to his credit. Same can be said for that never heard Feroz Khan as well. The logic is simple. Fool the nation and the poor and send the false notion that the real Mai-Baaps of the nation are all from the Gandhi family. Everything and everyone else are as useful as my Tennis coach. I am sure there would come a generation when people after seeing so many Gandhis in almost everything will think, Bharat is Nirmaned entirely by one family. Without them, as a nation we still probably would be hitting two stones to ignite fire. The populous votebank centric gimmicks are all after one Gandhi or the other. The idea was to tell the poor that they should bow before the real Mai-Baaps and vote for them perpetually without any conditions, because for them they are getting something to eat. The Mai-Baaps are the ones who gave them everything that they see around them. What the Mai-Baaps gave also includes the river, trees, streams, air and pretty much everything in-between which also includes but not limited to the painful boil at that awkward place. In fact the Mai-Baaps created this planet itself. Such is the idea of Bharat Nirman thrown at us. The Nirman of Bharat started with Nehru; stopped for a brief period during the time of Shastri, only to start again with energetic vengeance during Indira Gandhi. The Nirman continued by Rajiv Gandhi with full valor till he achieved his martyrdom. Narasimha Rao was a big nonsense and never thought about any Nirman during his period. Nirman was a completely forgotten adjective during a useless Atal Bihari Vajpayee’s governance, only to be restarted, much to the relief of the nation by Manmohan Singh, under the close watch of the Bharat Mata. Bharat Mata, the best thing happening to India since the birth of Jawaharlal Nehru. By the way, have you seen the Bharat Nirman advertisements or not? They all are epic, to say the least. People are getting crazy after listening something about escalators while in another a poor woman is pleading for food ration from a Lala only to be rescued by a learned Didi and her vowels against the thug. 66 years and counting but our people are going gaga over the existence of escalators and the shameless lots are terming them as an act of ‘Bharat Nirman’. I never felt the urge of some tight slaps on the cheeks of few shameless morons more than what I am feeling now. Had these morons have the slightest shame they wouldn't have floated Bharat Nirman nonsense after looting the nation for last five generation. Bloody jokers and first rate thugs. Once again as usual, You blame Congress and more so the Gandhi Family for all Bad Things happening in this country. Nothing New in that. 1. Why there is NO LOKAYUKTA in Gujarat for past 10 Years ? Lokayukta is a MUST to curb Corruption ? 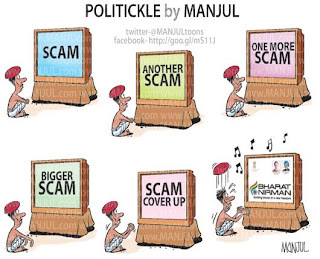 Is Modi Afraid that his Scams will get exposed ? 2. Why Sanjiv Bhatt, a Honest Cop was Suspended ? Why Haren Pandya was murdered ? 3. Today i.e. 3rd sept 2013, A Famous Cop called D G Vanzara resigned from his post, and wrote a letter to him, blasting Modi and his cronie, Amit Shah. He stated he was betrayed by both of them. What do you have say on that ? 4. What are the credentials of Amit Shah ? What he Really is ? Why is NAMO supporting him ? Why he acts as a Chamcha of NAMO ? If you could check and explain in your Blog, I would accept you as NEUTRAL, which our Private Media should Work and Behave. Else, you are nobody but a stooge of BJP,RSS/Sangh,VHP . You could also explain, why the Governor - Ms. Beniwal, rejected Modi's proposal of Lokayukta, recently ? Again bang on target. .... This party has made a mess of my country.... These pigs don't even die... Thats the only thing useful they can do for their motherland... ..
dear aditya it is because these incidence dont hv any significance to the current state of misery that indians face. that is truly a "localized incident", contrast to the so called localized incident of chinese incursions. our present state of affairs has nothing to do with amit shah, modi, haren pandya, sanjiv bhat or even lokayukta of gujarat. another thing wen justice mehra(lokayukta) had no problem working with autocrat indira y he wrote blaming modi as an autocrat..congress has mastered the art of deception in these 66yrs n u guys fall victim..always choose the lesser evil. About Lokayukta, I would say that when Lokpal is not at centre then how can it be at state level especially when state & centre governments are different. Centre will continuously attack state for wrong doings at a slightest opportunity if given by Lokayukta. Centre has been quite vicious in their attitude towards Modi & Gujarat why should Gujarat government give one more handle in the hands of centre to whip them? Especially when centre is not liable to similar authority (Lokpal)? IT is because of oversmart assholes like you we are suffering..for each of these claims i can give you more than reasons ur illogic brain can understand, but then you are just a representation of us and not going to change anything there.. I wish these losers and self serving thugs read your article and do some soul searching rather than attacking Modi all the time. That will help India moving forward. History will never forgive them and even in future we will be counting years, how they have ruled India, looted its resources and stacked money in foreign banks. It is a shame. You have described our nation's nirman very well. It is a shame that we are at the mercy of the politicians in general and the first family of the Congress in particular. How can you forge to mention "JAGAN the lootera from Andhra Pradesh". This Crook deploys sophisticated techniques to loot the resources & making money out by QUID PROKO (take this & give that policy). He can exceed all other scammers if we dont publicize about his bad deeds. There is a strong MODI WAVE sweeping across the nation. It won’t be a surprise if BJP under Modi reaches 300 on its own. But this is possible, ONLY & ONLY if each one of your follows these 4 Guidelines. 1. Have you registered your NAME in the VOTERS’ LIST of your Constituency? 2. Have you persuaded at least 5 of your neighbors to register their NAMES in the VOTERS’ LIST? 3. On the POLLING DAY, do come out & CAST your VOTE & make your neighbors CAST their VOTES. 4. In the 6 months to come before the General Elections, meet at least 50 RURAL PEOPLE & explain to them the SCAMS committed by Congress. DO NOT THINK OTHERS WILL DO. FYI Rajesh.. the bill goes to Governor only after clearance from legislative assembly of the state.. which if you dont know, has got enough candidates of BJP to pass it own their own without support from any other party. My dear friend have u ever questioned what the lokayuktas of maharashtra haryana andhra rajasthan assam tamil nadu doing???? The media also does not question this???? Only they want to take about lokayukta of karnataka and gujarat!!! Aditya K .....have u ever questioned what the Lokayukta of Delhi, Haryana Rajasthan Maharasthra Andhra Assam are doing????? Or do u expect us to believe that there is no corruption there and all is hunky dory????? Why u always want to talk about lokayukta of karnataka and gujarat??? Have u ever questioned the lokayuktas of ur cong ruled states ever??????? U r asking the credentials of Amit Shah!!!! Do u think the nation does not know the credentials of ur cong leaders????? Do they have any credentials apart from sycophancy??????? Have u forgotten the cong leader who explained why Pratibha Patil became the president of this country????? U have the cheek to question credentials of Amit Shah???? Shall i start showing u the Sanjiv Bhatts and Haren Pandyas of your cong ruled states?????? Bharat Neelam - 9 yr Itch ! We need fungicide, strongest possible detox medicines to cleanup the rut spread by Corrupt Con-Gress Farty! As for your article its simply superb.